A stylish hamper is overflowing with exclusives from Lindt, Ghirardelli and Marich premium chocolates. Paired with savory snack mixes, roasted almonds and sweet candies, our expert gourmands have created this rich menu to be savored and remembered. Lindt Caramel Truffles, Ghirardelli Squares, Marich Toffee Caramels. Lindt Dark Intense Orange Excellence Tablet, Artisan Truffles. Milk Chocolate Malt Balls, Sour Blueberries, Fresh Almonds, and more. Your gift will leave a lasting impression as they continue to enjoy this elegant keepsake basket with contrasting hand-stitching. Measures 13" x 11" x 8". The Luxury Chocolate Collection Gift is a hand delivered gift. These gifts are delivered by one of our local design centers located throughout the United States and Canada. Same day delivery is available for most gifts when ordered before the cutoff time. The cutoff time for The Luxury Chocolate Collection Gift is in the recipient's time zone. Cherry SoursChewy, red confections with that classically irresistible tart cherry flavor. Seasoned AlmondsDusted with a savory blend of seasoning and spices for an irresistible flavor, perfect with a cocktail or as an after dinner treat. Tropical Island MixA variety of healthy, naturally sweet & delicious dried fruits such as pineapple, papaya, mango, kiwi, banana, and coconut. Chewy Fruit Slice GemsChewy, sugar-coated candy in delicious assorted fruit flavors. A sweet classic that is perfect for sharing. Old Fashioned Lemon DropsOld fashioned hard candy lemon drops, made from real lemon juice and dusted with fine sugar. Not too sour and a little bit sweet - a classic confection. Spanish QuicosDelicious Spanish corn nuts, toasted and seasoned to perfection for a crunchy, salty snack. Yogurt Covered PretzelCrisp, buttery mini pretzels are double dipped in smooth creamy yogurt for a delicious snack. 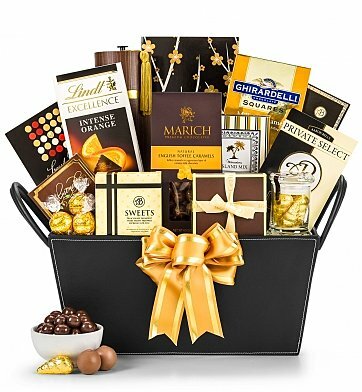 Premium chocolate and superior snacks generously fill a fine tailored basket, making this a truly impressive gift. We received this as a gift from our realtor. It was such an awesome gift from a special lady and everything was delicious. We can't wait to pass this treat on to someone special. We use the container everyday. It is in our bedroom as a catchall. What a beautiful presentation. Sent out several different gifts to family and friends and each and everyone of them cannot stop thanking me and saying how they loved the baskets. The chocolates, cookies, etc. were delicious and they all can use the baskets they came in. Will definitely order from Gift Tree again. Thank you for making it easy to sent gifts out of my home state.